In tax legislation 1543, by the Swedish king Gustav Vasa, Bissjön is mentioned as Biörnasjön with seven settlers. (”Biss” is an old Nordic -word for a female Bear) There is also told about a mill in the village. The first motor road was built in 1925. Earlier Gamvallsvägen (Meaning the old road to Vallen) was the normal route to Lövånger, Burträsk and Skellefteå. Gammvallsvägen connected to Kustlandsvägen (E4 of that time) in Afingbyn. If you start your hike where Ersnäsvagen connects to nowadays-main road, east of the road, you can see a sawmill operated from 1930 to the middle of 1970. Besides typical settlements of the region, sonic as old as 200 years, following sights can be seen in turn during the tour. 1. Brooding hen. A big flat rock on smaller rocks (eggs) as legs. The ancient monument is in sight from a sign at Ersnäsvagen. Science does not know the original function of this type of monument. District court and/or as ”Mora Sten” a site where chiefs were appointed thrills the imagination. Three cairns and a brooding hen inside a circle with 500 m radius must signify something. 3. Water powered mills/sawmills/chipboard machine. The rapids in Bissjön have been exploited since time immemorial. 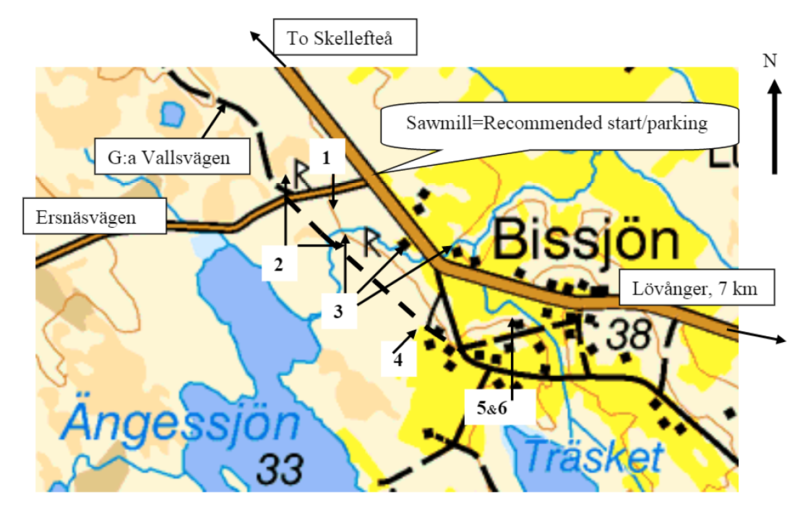 Even today channels and foundations to sawmills and mills can be investigated where Gammvallsvägen is crossing Bissjön, at Simmersbacken and also at Karlforsen east of the bridge were the main road crosses Bissjöån. Also farmers in Hökmark have periodically been allowed to use mills in Bissjön. Recommended Halting Place. 4. Community centre. (Former school and chapel) Village school from 1906 when it was built to 1956 when the building was transformed to a village chapel. 2002 the building was acquired by the village community. A library from the 1930th and the oldest maps of the village are kept there. 5. Millennium monument. A pyramid built of 20 rocks from village ground is situated about 20 m north of the village cottage. The 20 rocks represent a century each. Inside the pyramid is a case made of acid-proof plate and filled with inert gas. It contains drawings made by children of the village, a map. coins and bills from groceries e.t.c all supposed to mirror the last decades of 1900. 6. Flora. Along the trail signs are pointing out mostly typical plants of the area – but telling the truth -do you know their names? Have a nice hike in a village of great natural beauty and historically interesting sights, which we together manage with carefulness!